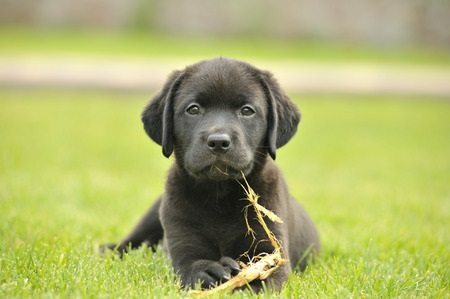 Do you have a Labrador puppy that gets overexcited very easily? It’s not uncommon at all for this to happen. Labs are known for having a lot of extra energy, and puppies, in particular, will often struggle to contain themselves when they are feeling energetic. There are simple steps you can take to calm a lab puppy down when it starts to show signs of over excitement. Stop doing whatever it is you were doing before the lab puppy started to get excited. There are all sorts of things that can excite a lab puppy. If you find that your puppy is starting to get too worked up in a specific scenario, stop whatever it is you’re doing before the puppy gets overexcited. Whether that means putting away a toy the puppy was playing with or stopping a game that you were playing with the puppy, you need to remove the trigger for the excitement right away. Take your lab puppy to a quieter environment. While stopping whatever it is that got your lab puppy excited is the first step, that’s probably not going to calm the puppy down completely. To reach a calmer state, the puppy will need to be placed in a quiet area where it can relax for a few minutes. This could be a crate, a dimly-lit room, or even your backyard. The key is finding a place where the lab puppy can compose itself before it gets too out of control. Avoid situations that make your lab puppy excited in the first place. Once your lab puppy has calmed down, take note of what caused it to get so excited. Then, steer clear of that activity for the time being. The dog might be able to handle the activity again in the future without getting too excited, but for now, it’s probably not prepared to handle it without working itself into a tizzy.